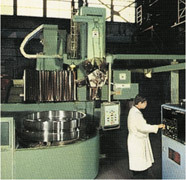 Large-diameter castings. Long forged shafts and axles. Every size and shape in between. R&W Machine's turning capabilities produce exceptional precision-machined parts for all of your requirements, in large or small lot sizes. We can turn parts up to 76" in diameter, and shafts up to 120" in length, making us the ideal choice for virtually all of your turning needs. Combining our skilled personnel with our advanced CNC turning and cylindrical grinding equipment, tight tolerances down to .0001 of an inch are routinely maintained and micro finishes as fine as 2 RMS are attainable. Whatever your goals, R&W Machine will help you meet them.